Cruising speed and fuel consumption info supplied by owner's copy of Caterpillar 3160 spec sheet: 7.0-7.2 knots, 1600 RPM, 2.7gph. Owner reports personal max speed 8 knots, 1800 RPM, spec sheet indicates consumption: 3.6gph. Engine hours are approximate as original meter was replaced. Engine and transmission had complete mechanical check late 2015. Batteries: 2 house which includes bow thruster; 1- starter. Electrical system renewed and upgraded in 2009-2010 including new boat cable wiring, GFI outlets and Magnum inverter/charger, ME Series. Hull is Southeast Asian Mahogany 1-1/4" thick. Beams, bulkheads, ceiling and keel are all mahogany, fastened with bronze wood screws. At the time of current owners' purchase, the boat had been stored on dry-dock. Prior to launch: seams resealed, serviced and installed new thru hulls, seacocks, and bilge pumps. Bottom soaked and leaks checked. Owner, with assistance of shipwright, has repaired and painted flybridge and main cabin walls; quarter round base molding, where the main cabin meets the deck, was removed, re-caulked and re-bedded to be water tight. Fuel tanks: welded steel and painted, 170 gals each. Water tanks: stainless steel; 170 gals total. Holding tank: plastic; 40 gals with macerator. Waterline Boats / Boatshed did not independently verify capacities, dimensions, conditions or consumption described in this listing. Information is derived from seller-provided information and/or literature. Boarding this Classic 36 is via a gate either port or starboard with entry to the cabin via a door to starboard of the helm. The main aft cabin has a hatch door and companionway directly from the sundeck area into the cabin. Entering at the helm there is an L-shaped leather settee with fold out salon table to starboard (which converts to a sleeping berth). To port is a leather settee just aft of the galley area. Forward of the galley and helm is a guest suite with valuable storage area as you step down three steps via the companionway. It has a full v-berth, and private head. The aft cabin, also down three steps from the saloon, has a large hanging and storage cabinet to port with a very large teak desk just aft. Across, to starboard, is the large double berth and full head. For comfort, she is equipped with an Espar diesel furnace. The galley is equipped with a Magic Chef 4-burner propane stove and oven, and Sea Freeze refrigerator installed in 2002 (new compressor motor and system, 2007). There are parquet floors throughout. The deep bulwarks, wide walk around decks, and bow are easy to move about and lend to a sense of safety while out on deck. The flybridge is easy to access via a few steps off the aft cabin roof. The mast and bimini are hinged for ease when preparing to dock in the boathouse. There is good seating for guests, area for additional chairs or small table, and great visibility for the captain. There are canvas covers for the front windshields, aft stateroom windows, and escape hatch. She has beautiful classic lines; many items have been repaired and her care shows. Anchors: Main - 40 lb Danforth, Auxiliary - 35 lb Delta. Chain: 5/16 galvanized, rode seen but unknown length. Windlass: Lewmar Pro-Fish, Stainless Capstan and chain gypsy; new 2008. Compass: Ritchie, lower helm; small Ritchie compass on fly bridge. GPS/Chartplotter/Depth: GPS Map 238 Sounder. Standard depth sounder on flybridge. Wesmar Bow thruster control at lower helm and flybridge. Clock and Barometer: Weems and Plath. This GB 36 Classic is truly a wooden classic! One of the last of this model, built with Philippine mahogany. She was built at the “new” shipyard in Singapore just prior to Grand Banks’ switch to a fiberglass hull mid-1973. This is a two-cabin, single diesel engine with flybridge layout; interior has parquet floors, leather settees, two heads. The current owner has lovingly worked to restore her; repairing decks, cabin, varnishing bright work, and completing upgrades to capture and preserve this truly iconic boat. GB 36 models are known for their seaworthiness and stability due to the semi-displacement hull, deep forefoot, long keel and hard chines. She has been boathouse kept for protection and to maintain her restoration. The Bellingham, WA boathouse is also available for sale. 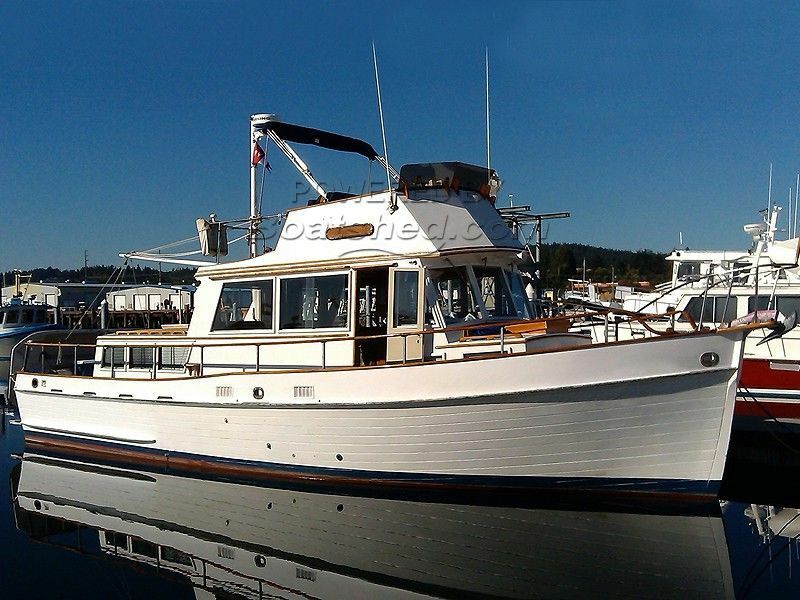 This Grand Banks 36 Classic has been personally photographed and viewed by Gretchen Miles of Boatshed Everett. Click here for contact details.